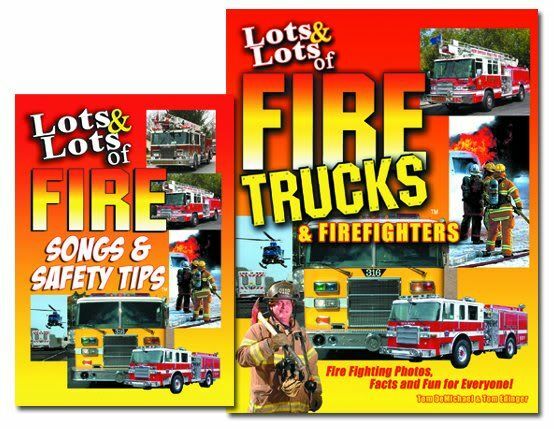 When Marshall Publishing came up as a TOS Crew Vendor, I was really excited to be able to get a DVD and book set on Fire Trucks. I mean, doesn't that just look fun??? I don't think the DVD had been in our house even ten minutes when we popped it in for the first time. Trina (kindergarten) and Richard (2nd grade) loved it. My 7th and 9th graders pretty much just rolled their eyes (but admitted that there was some good information included). My 5th grader? He enjoyed it too, but kept trying to not look like it. I should have let him watch it that first time without his big brothers around. Of course, my little kids loved seeing all the different fire trucks go zooming by. And Richard is able to sing along to almost everything.... "I see lots and lots of fire trucks, I can see those big engines roarin' down the street..."
Richard's favorite segment is the one where they build a Firetruck. I'll confess I think that one is pretty cool too. seeing firefighters at work in a huge variety of settings, fighting fires in houses (including breaking out the windows, or chopping through the roof), other buildings, car wrecks, forest fires, etc. The book is even better. An 8.5x11" sized paperback, it is 124 photo-packed pages and is simply amazing. The book starts off with an introduction to Firefighter Joe, and launches into a set of pictures of the personal gear that Firefighter Joe needs to put on. For Trina, I skim the text and make a comment or two about the picture. Richard clearly remembers visiting a fire station last year and watching a couple new firefighters being drilled/timed in getting ready, so he wanted me to read everything to him. Even my older boys got into this book... my two struggling readers were drawn in by the photos, and the text wasn't overwhelming, so they were willing to work at reading some of it. My 9th grader found it informative as well. I'd say this book would be fantastic for pretty much anyone of any age if they are interested in fire trucks and/or fire fighting. It would make a great spine for a couple weeks of fire safety and awareness as well. Consisting of twenty chapters in all, some are not going to especially appeal to younger kids. And a couple are more like appendices (Fire House Museums, Fire Related Websites). But overall, there is such great information in this book. The chapter on fires in history and the timeline were a big hit with my high schooler. The chapter on Firehouse Recipes appealed to my 7th grader. My 5th grader liked the Fire Science Basics (the older two felt they already knew all that). Richard loved all the pictures of the trucks and the gear. Trina liked the part about the Firehouse Dogs. Everyone liked the Fireman's prayer. Available at a web sale price of $29.95, you can get an additional $10 off that price by entering the code TOSF1 at checkout. The book and DVD are also available separately, but with this coupon you may as well get the set! You can also look into some of their other titles, such as the two Lots and Lots of Fire Trucks DVDs, or DVDs about trucks, jets or trains. I also had the honor of reviewing George Washington Carver, a DVD from Marshall Publishing. You can read about that here.